The following example is a quick walk-through of the basics of building a conceptual model and converting this to a numerical model. If you cannot find these files, please download them from our website. •Select [File] then [New Project...]. The Create Project dialog will appear. •Type in project name 'Conceptual Modeling Tutorial'. •Click the [ ] button in Data Repository field, navigate to a folder where you wish your projects to be saved, and click [OK]. •Define your coordinate system and datum (or leave the default value - Local Cartesian). 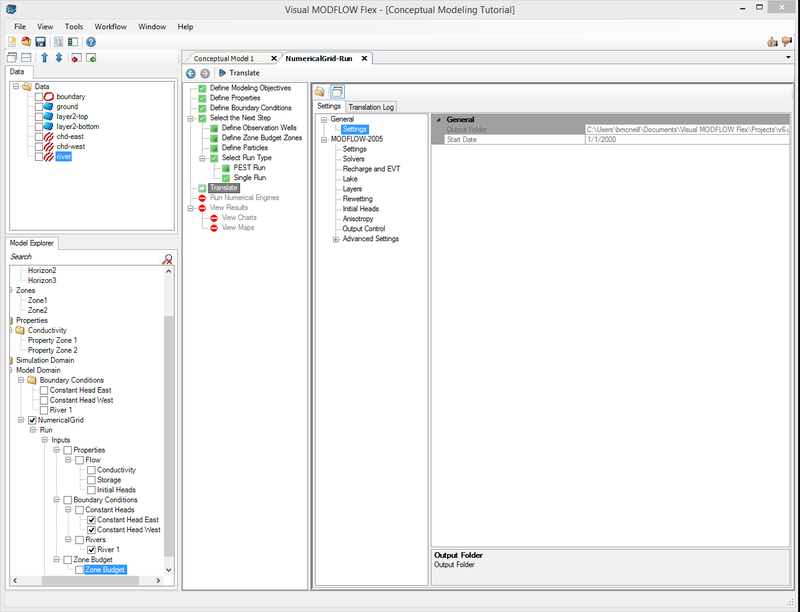 •Select [Conceptual Modeling] and the Conceptual Modeling workflow will load. •In the Define Modeling Objectives step, you define the objectives of your model and the default parameters. 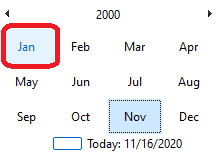 •The Start Date of the model corresponds to the beginning of the simulation time period. 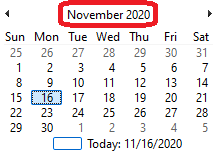 It is important to define a relevant start date since your field measurements (observed heads and pumping schedules) will be defined with absolute date measurements, and must lie within the simulation time period. For this scenario, the default objectives will be fine. 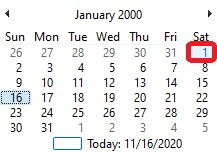 The selected date (January 1, 2000) will then appear for the Start Date. •For this scenario, the remainder of the default objectives and values will be fine. •The next step is to import or create the data objects you will use for building the conceptual model. •Select Polygon in Data Type combo box. •In the Source File field click the […] button and navigate to your 'My Documents' folder, then 'VMODFlex\Tutorials\ConceptualModel\supp files', and select boundary.shp. Please Note: The files may be located in the public documents folder: "C:Users\Public\Documents\VMODFlex\Tutorials\Conceptual Model", if you selected to make the program available to all users on install. •Click [Next>>] then Click [Finish]. •The next step is to import a surface that represents ground surface. 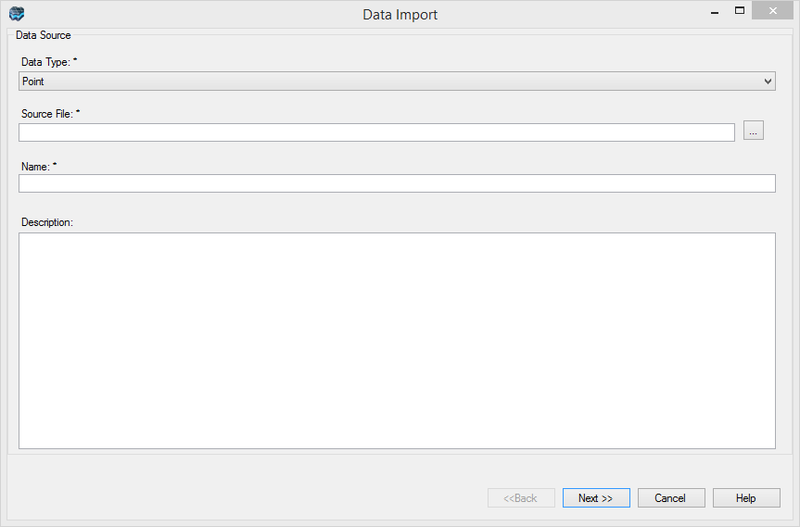 •Click the [Import Data] button. •Select Surface for the Data type. •In the Source File field click the […] button and navigate to the 'My Documents' folder, then 'VMODFlex\Tutorials\ConceptualModel\supp files' folder, and select ground.grd. •Click [Next>>] through all the screens to accept the defaults, then click [Finish]. •Repeat these steps to import the remaining Surfaces: layer2-top.grd, layer2-bottom.grd. •Next, import polyline data objects, and from the same source directory ,select chd-east.shp; use all the defaults and finish the import. •Repeat these steps, for polylines, importing first chd-west.shp, then river.shp. 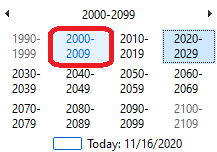 •Once the data objects are imported, they will appear in the tree on the left side of the program window. •Click on the check box beside each of the data objects you imported, and they will appear in the 3D Viewer. •Increase the vertical exaggeration and reorient the screen so that you can see all your data objects, as in the image below. •On the Conceptual Model tab click [ ] (Next Step) to proceed, where you will arrive at the Define Conceptual Model step. •Provide a name for the conceptual model (e.g. Conceptual Model 1), and model area. •From the Data Explorer, select the polygon data object called boundary. This represents the conceptual model horizontal boundary, and then click the [ ] button to insert it as the reference object in the Define Conceptual Model workflow step. Please Note: The model area cannot be defined using a complex polygon, or one that contains multiple polygons. A complex polygon is a polygon that intersects with itself. •Click [Save]. 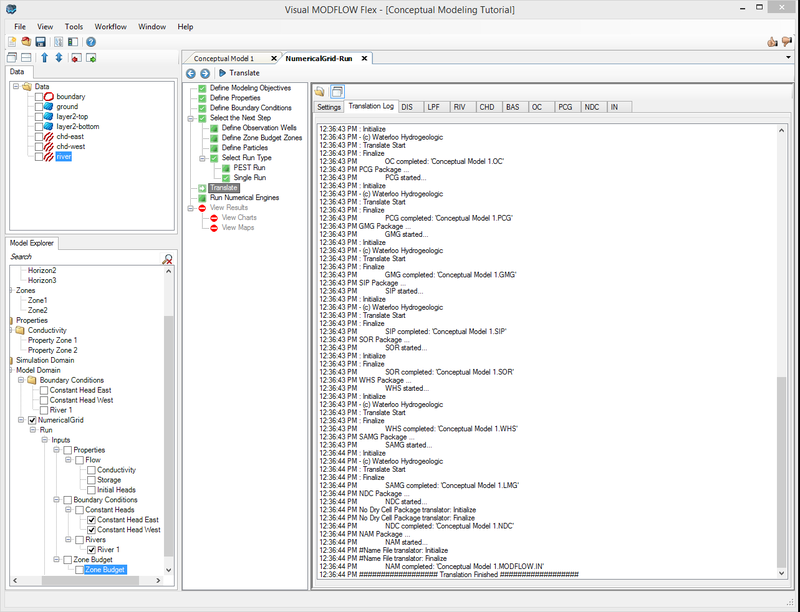 Notice that the conceptual model elements have been added to the Model Explorer tree in the lower left section of the application window. •Click [ ] (Next Step) to proceed to the Define Model Structure step. Defining the geological model consists of providing geological surfaces as inputs for horizons. Then three-dimensional solids are created between these horizons.To create new horizons, follow the steps below. 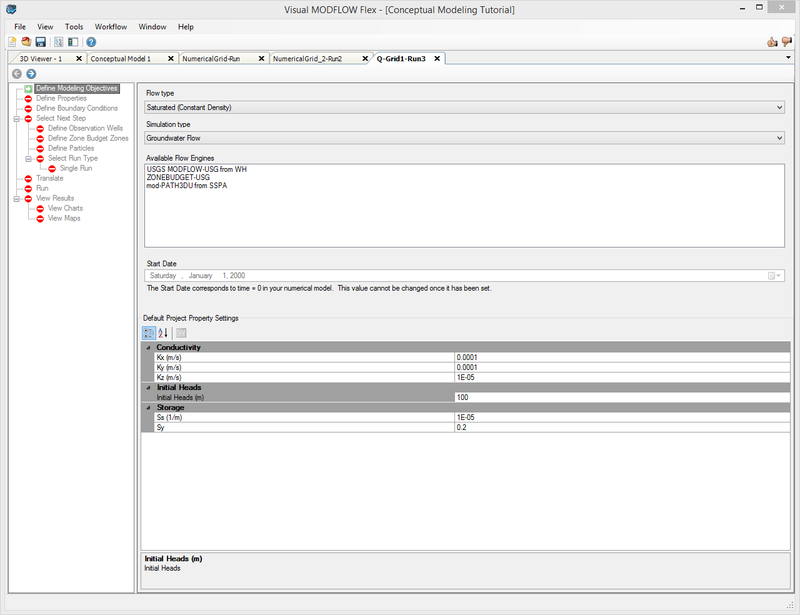 •From the Horizons Settings dialog (shown below), click the [ ] [Add Horizon] button to add a new horizon row to the Horizon Information table. •Repeat this two more times so there are 3 new rows on the Horizons table. •Click the [ ] button in Row1 of the Horizons grid, to insert it into the Horizon Information table. See the example below. •For this example, the default horizon type will be adequate. For information on each horizon type, please refer to the "Horizon Types" section of the user manual. •From the Data Explorer, select the layer2-top surface data object, click the [ ] button in Row2 of the Horizons grid, to insert it into the grid. 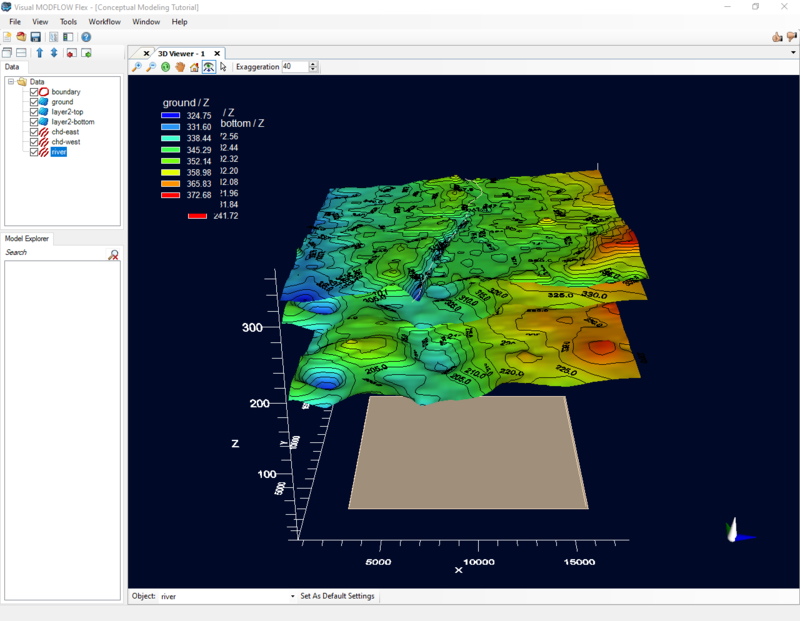 •From the Data Explorer, select the layer2-bottom surface data object, click the [ ] button in the Row3 of Horizons grid, to insert it into the grid. Please Note: Horizons must be added from the topmost geological layers and working downwards. •You can preview the horizons in the adjacent 3D Viewer by clicking the [Preview Horizon] button. •Once finished, you should see a display similar to the one shown below. •Click the [ ] [Create and Save] button to generate the model horizons, you should see them populate into the Model Explorer. •Finally, click the [ ] button to proceed to the next step (clicking the [ ] will also automatically generate the model horizons, if you didn't already click the [Create and Save] button). Once you have imported sufficient raw data into your project, you can begin to construct one or more conceptual models using imported or digitized data objects as building blocks. 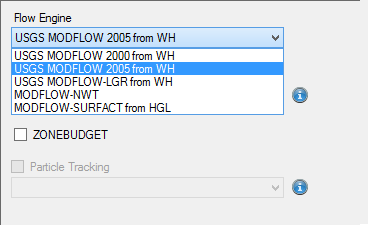 At this step, you can view/edit the flow properties for the model. 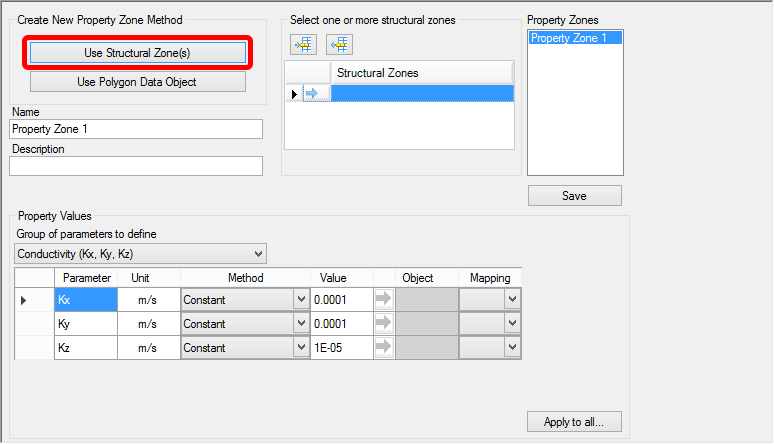 There are two ways to define property zones: Using Structural Zones, or Using Polygon Data Objects. 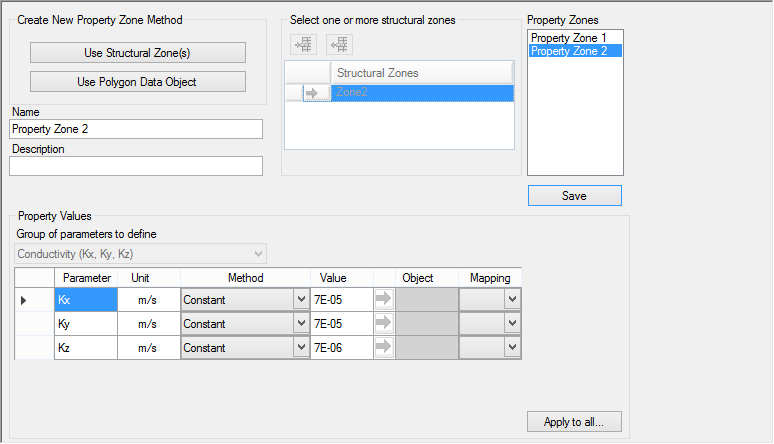 This method allows you to create a property zone from existing structural zones in your conceptual model, i.e., zones generated from horizons. 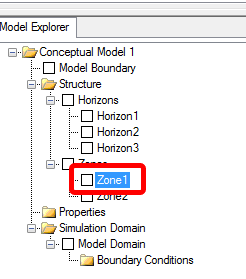 •Click the [ ] button to insert the zone in the Structural Zones field, as shown below. •Select the Group of parameters that will be defined, e.g., Conductivity, Storage or Initial heads. The data input grid below will display the appropriate parameters based on which parameter group is selected. For example, if conductivity is selected, the data input grid will show the parameters Kx, Ky, and Kz. The data input grid will already be populated with the default values specified in the Project Settings ([File] > [Project Settings...]). •Click on the [Save] button located on the right side of the window. 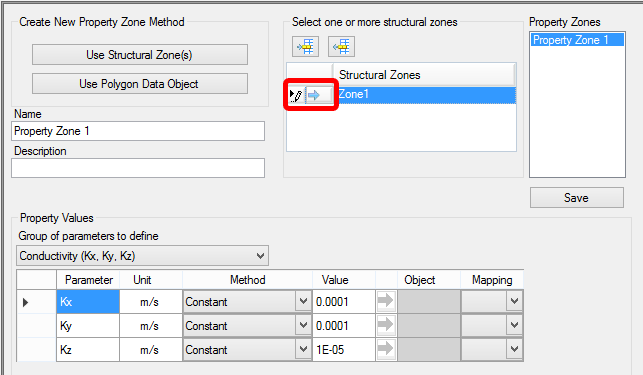 •Click on [ ] button to insert the zone in the Structural Zones field, as shown below. •Click [ ] (Next Step) to proceed to the Selection screen. 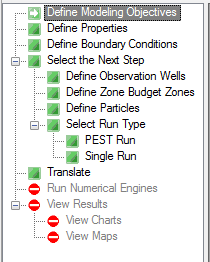 •In this screen, you can choose to proceed to Defining Boundary Conditions or proceed to Defining a grid or mesh. •Click the [Define Boundary Conditions] button to proceed. 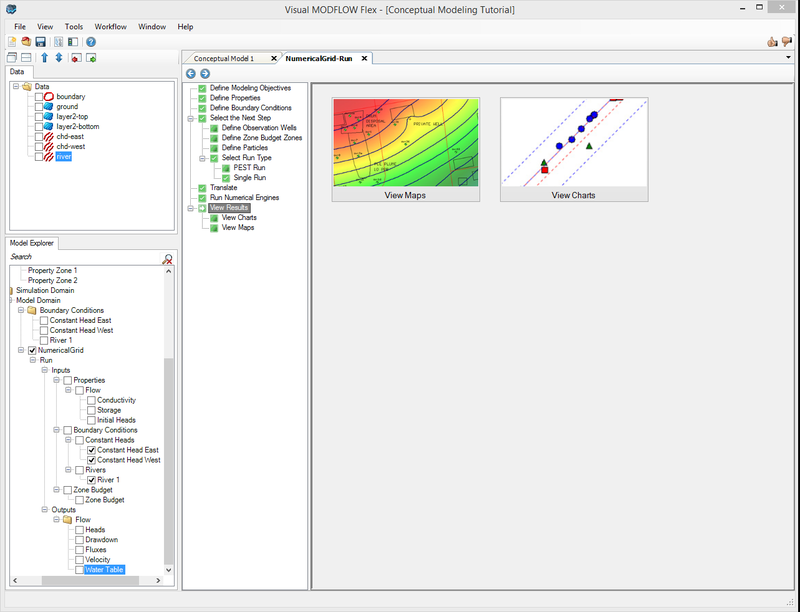 In this window, you can choose the type of Boundary Conditions: Standard MODFLOW Boundary Conditions (CHD, DRN, RCH, etc. ), Pumping Wells, or Walls. 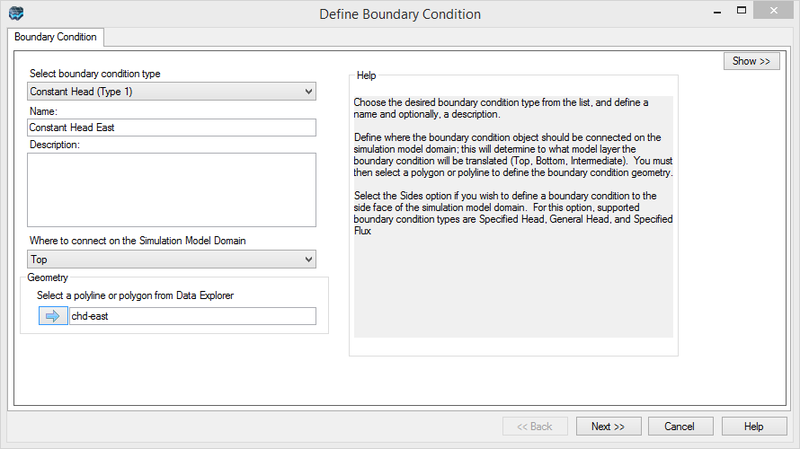 •The Define Boundary Condition dialog box will appear on your screen as explained in the following section. 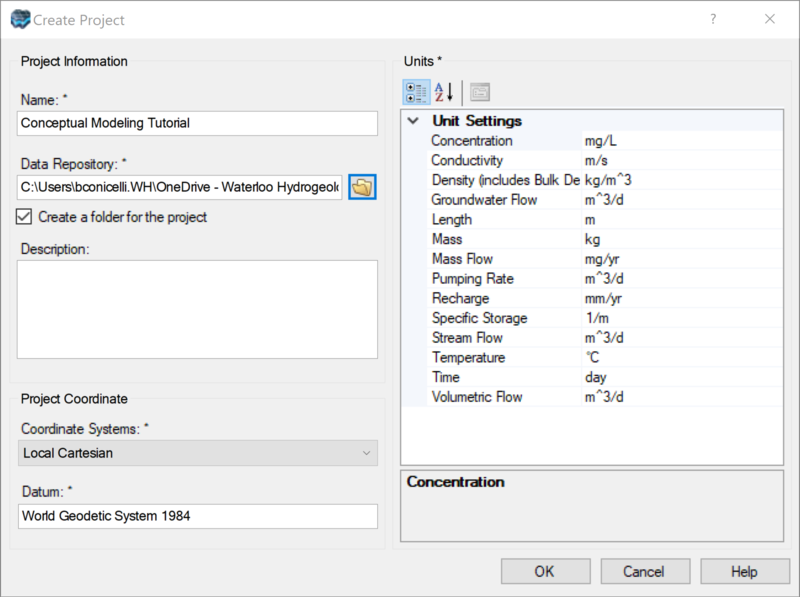 •At this step, you can define flow boundaries for the model. 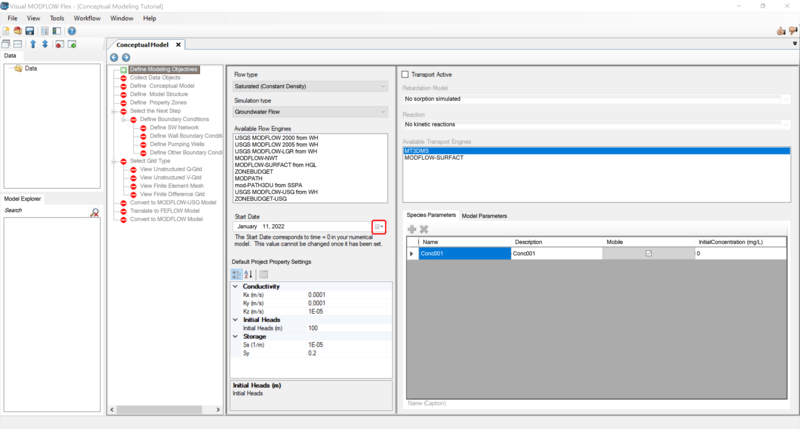 •From the Select Boundary Condition Type combo box, select the desired boundary condition type. •Type name: 'Constant Head East'. •From the Data Explorer, select the chd-east polyline that represents this constant head. 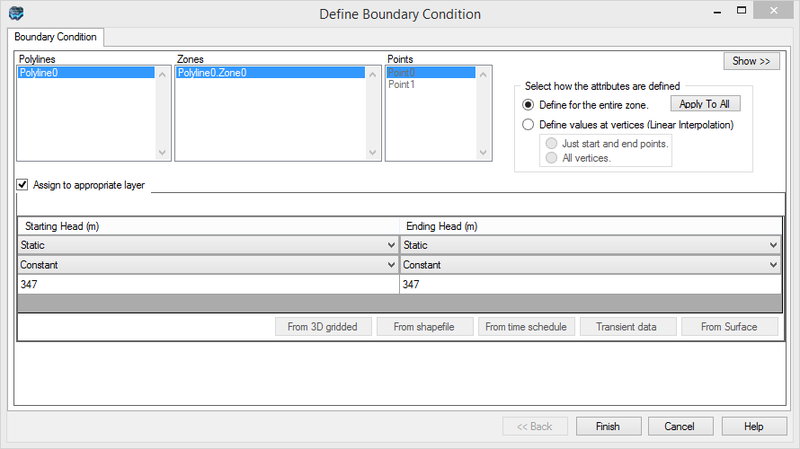 •Click the [ ] button in the Define Boundary Condition dialog, to add this polyline to the input. •The next dialog allows us to define the constant head value. 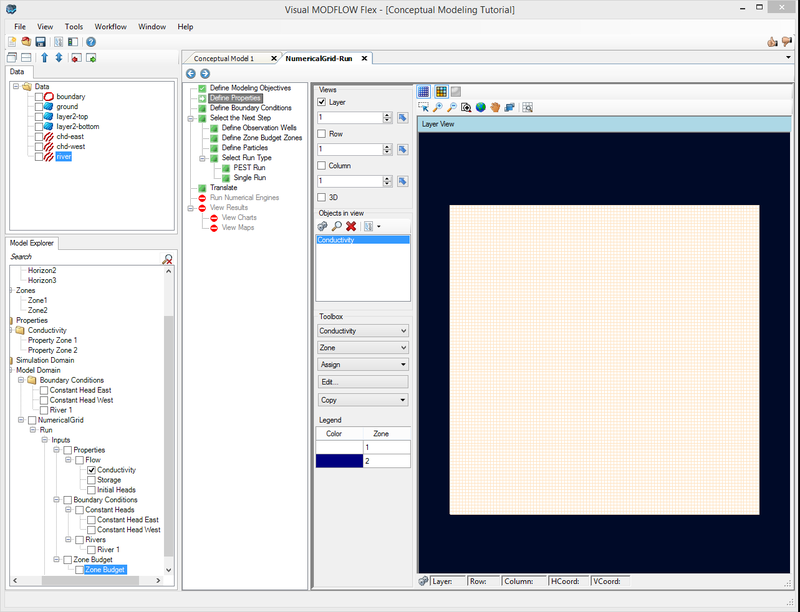 Visual MODFLOW Flex provides various options for defining boundary condition attributes. 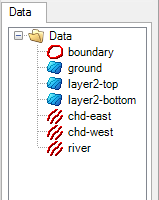 Attributes can be assigned from those stored in Surface, Time Schedule, Shapefile and 3D Gridded data objects. You can also set attributes as Static (no change over time) or Transient (changes over time). •For this tutorial, you will assign a static constant head value. •In the empty fields located below the 'Starting Head (m)' and 'Ending Head (m)' fields type '347'. •Select the [Define Boundary Conditions] button. Before you proceed, you will define one more boundary condition, a River. 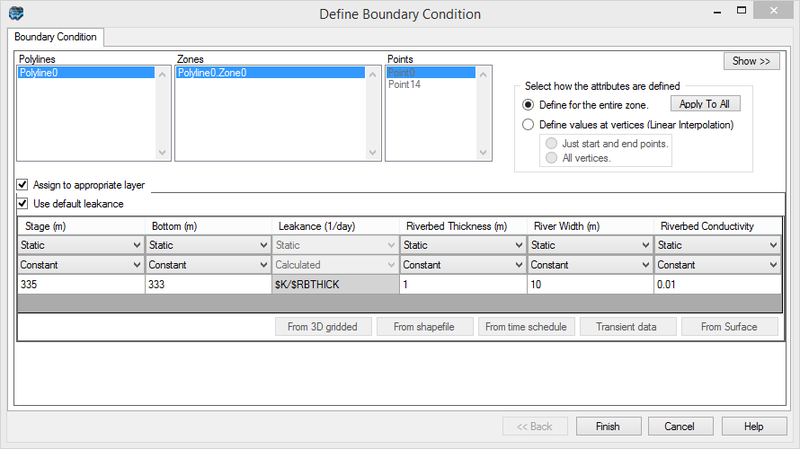 •Click on "Define Boundary Conditions" in the tree, and select the [Define Boundary Condition] button. •Define the following attributes for the river, as shown below: Stage = 335 (m), Bottom = 333 (m), Riverbed Thickness = 1 (m), Width = 10 (m), Riverbed conductivity = 0.01 (m/s). 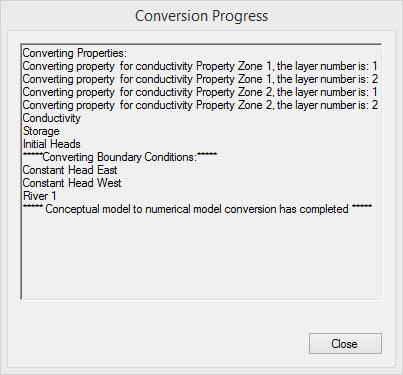 •The River conceptual boundary condition will be added to the model tree. •The following display will appear. 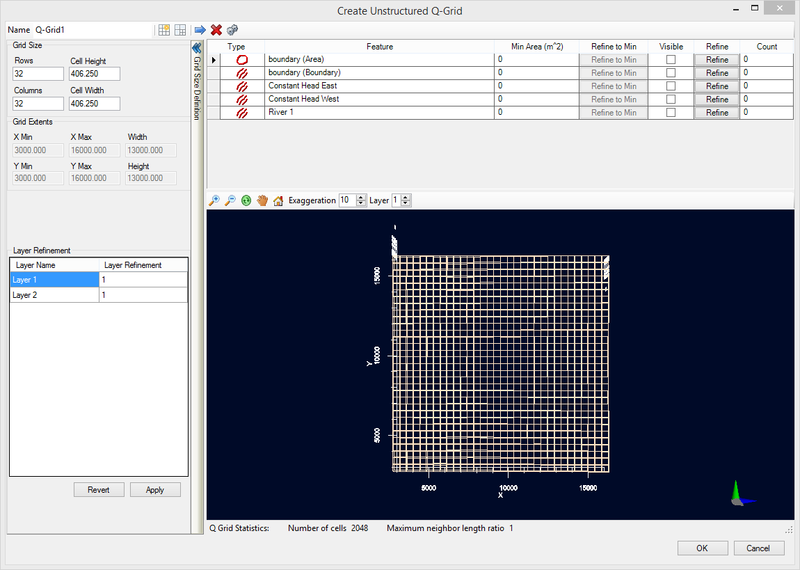 •Define Unstructured Q-Grid: for a MODFLOW-USG run with a QuadTree grid. •Click the [Define Finite Difference Grid] button and the following window will appear; define the inputs as explained in the following section. 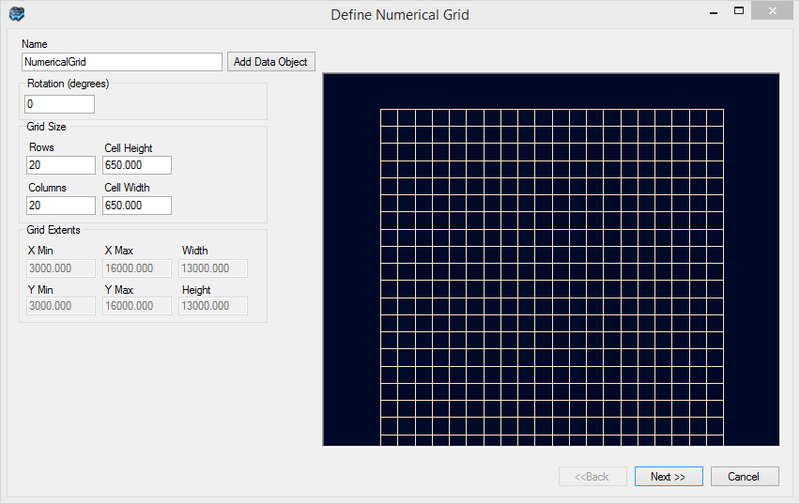 •Enter a unique Name for the numerical grid. This name will appear in the Conceptual Model tree once the grid is created. •Enter the grid size, and optionally, the grid rotation. The grid can be rotated counter-clockwise about the grid origin by entering a value between 0 and 360 in the Rotation text field. •The Xmin and Ymin values refer to the X-Y coordinates of the bottom-left corner of the numerical grid. The Xmax and Ymax values refer to the X-Y coordinates of the top-right corner of the numerical grid. •The Columns and Rows fields allow you to define the Grid Size. 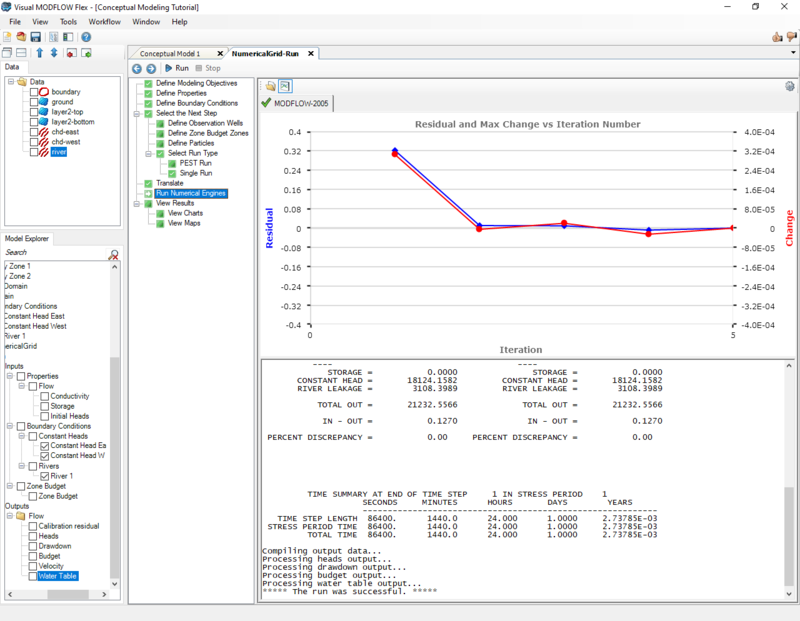 •Click the [Next>>] button to proceed to define the vertical discretization. You will then see a cross-section preview of the grid. •By default, the vertical exaggeration is 1. Locate the 'Exaggeration' value below the preview window, and type '40' for the exaggeration value, then click [Enter] on your keyboard. •For this exercise, the default Deformed grid be used. •More details on the grid types can be found in the "Defining Grids/Meshes" section of the manual. •Leave the defaults as is; click the [Finish] button. •The Grid will then appear as shown in the following screen. Now you are ready to populate the numerical grid/mesh with the conceptual elements. •This conversion could take several minutes, depending on the size and type of grid you used, and the complexity of the conceptual model inputs. •A new window displaying the conversion progress will open. You should see a message indicating that the model conversion has completed. Click [Close] to dismiss this window. •Keep the default modeling objectives and click [ ] (Next Step) to proceed to the Properties step. 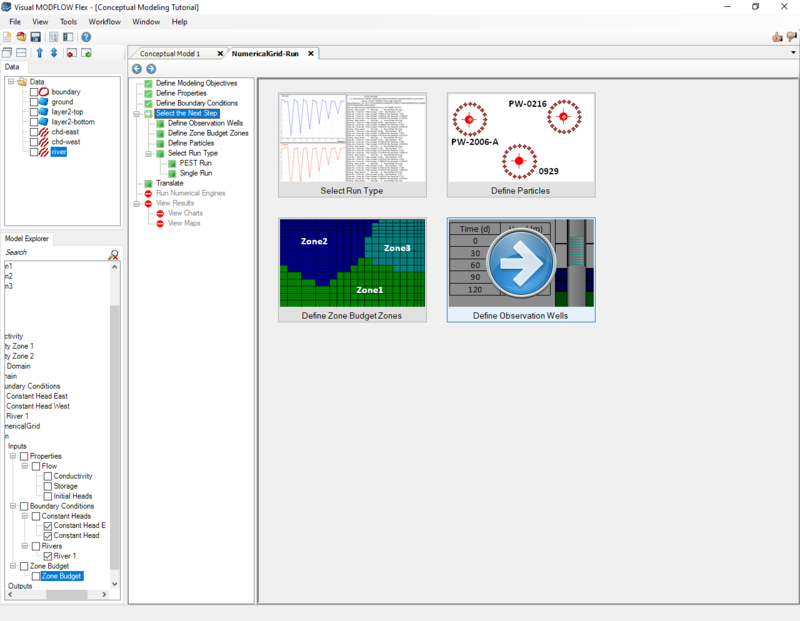 •Under Views, select the various views you want to see in the Flex viewer; VMOD Flex allows you to simultaneously show a layer, row, column and 3D Views. Place a checkbox beside the desired view and it will appear on screen. •Now you will define a default initial heads value. •Click [Edit...] button located below the Initial Heads combo box. •Type '350' in the top 'InitialHeads (m)' cell. •Then press [F2] (or the [ ] button) to propagate this value to all other cells in this column; this will apply an initial head value of 350 for the entire model domain. •Click [OK] when you are finished. 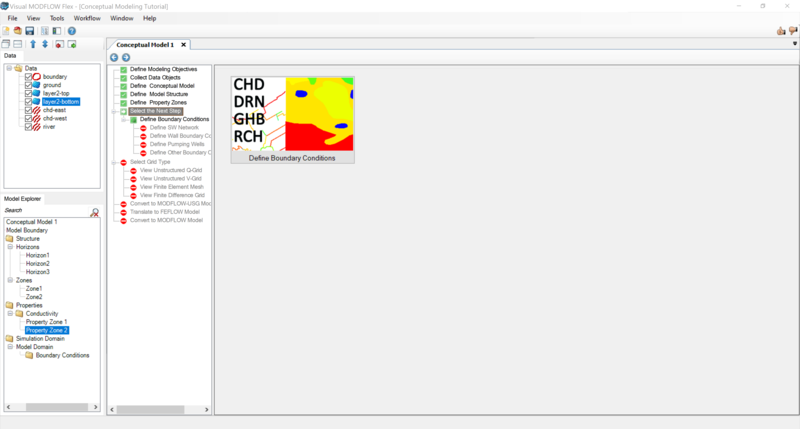 •The display tools located above the grid viewer window allow you to switch from discrete cells rendering to color shading/contours. 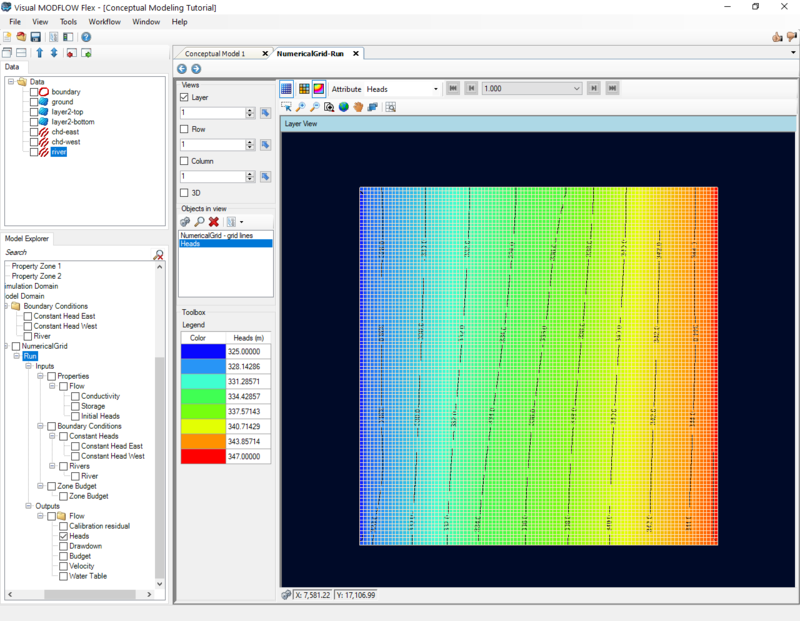 •In the Toolbox, you can select a different parameter group and see the corresponding zonation in the Flex Viewers. For example, try turning on the column view and switching to Conductivity to see the two zones you defined earlier. •Click [ ] (Next Step) to proceed to the Define Boundary Conditions step. 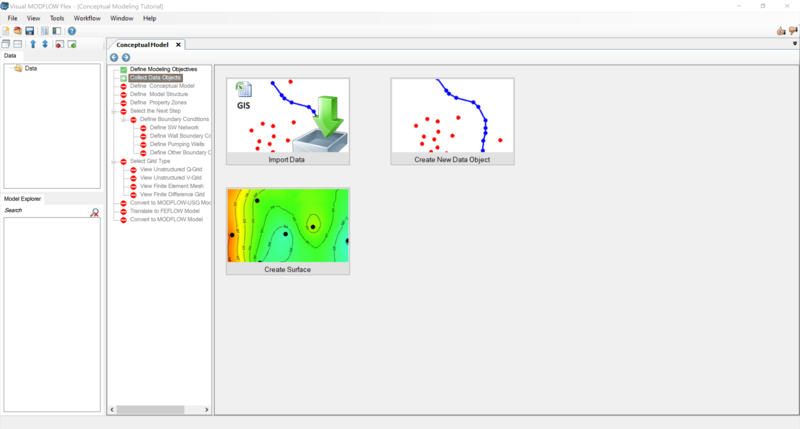 •At this step, you can view/edit the flow boundaries for the model. 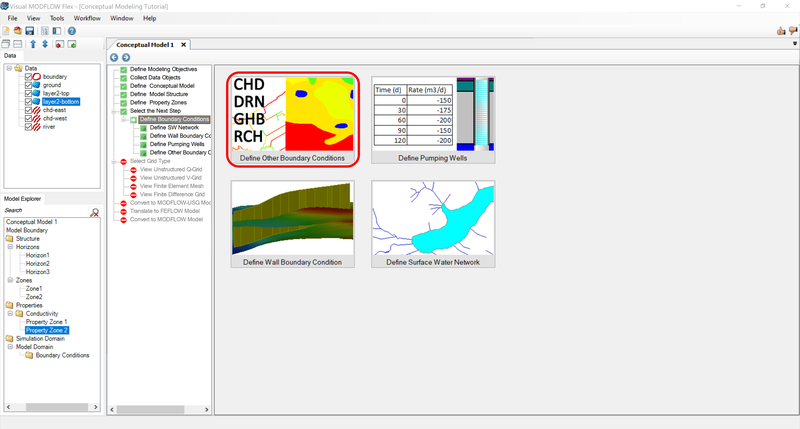 •From the Objects in view window, select the Desired Boundary condition group (Constant Head, Rivers, etc..). •Click on a cell that belongs to this group; a dialog will appear where you can see the values for the boundary you selected. •Click [OK] to close the view. •Click [ ] (Next Step) to proceed. You will arrive at the 'Selection' step. •Click the [Select Run Type] button to proceed (Mouse over this and you will see the blue "Next" arrow appear on top; just left click once to select this option. (Alternatively, the [ ] (Next step) button will take you to this step, as it is pre-defined as the default step. •Click the [Single Run] button to proceed (Alternatively, the [ ] (Next step) button will take you to this step). 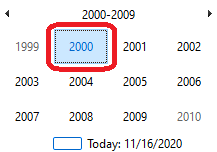 •MODFLOW-2005 should be selected by default. 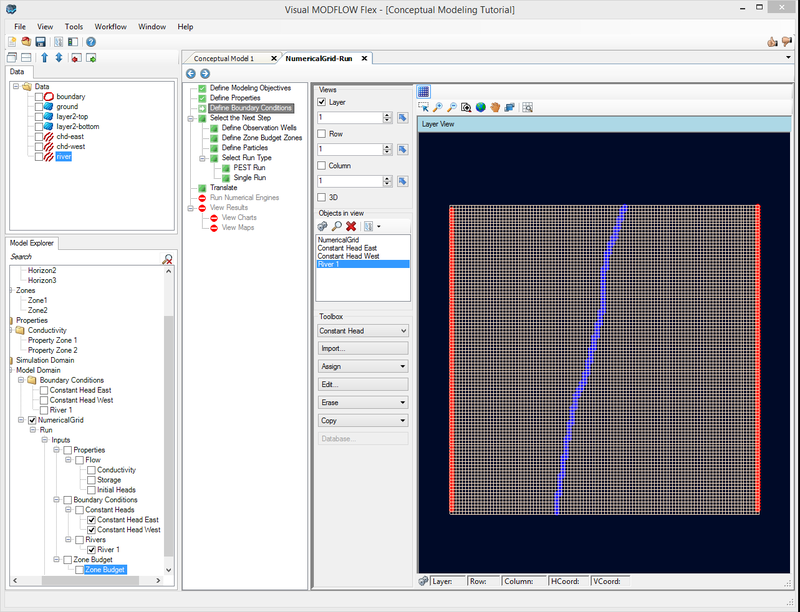 At this step, you choose if the model is steady-state or transient, choose the solver you want to use, and define any other MODFLOW package/run settings, such as cell-rewetting, etc. •Click the [ ] button near the [ ] button to proceed; this will read the input from the numerical model and “translate” this into the various input files needed by MODFLOW and the other engines. The files will be created in the directory defined in the previous step. •Click the [ ] button near the [ ] button on the main workflow toolbar to start running the engines. You will see the Engine progress in the scrolling window. 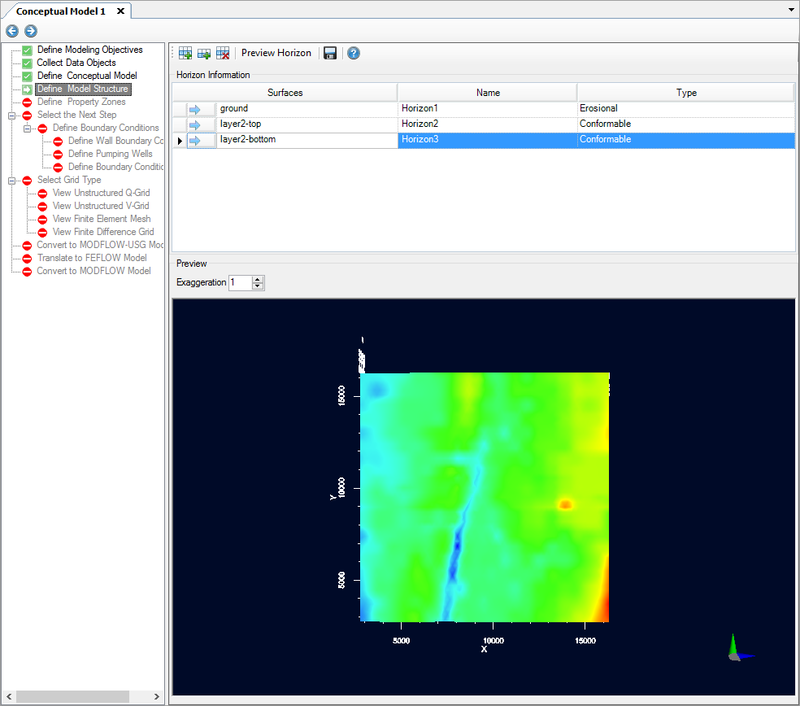 Please Note: after a successful run, the Heads and Pathlines items will be added the tree in the Model Explorer tree in the lower left of the application window. •Hit F4 to hide the Workflow tree and make more viewing area for the maps. Please Note: you can turn the workflow tree back on by hitting F4 at any time. •You can see color shading of the calculated heads, in layer view. •You can display heads along a row, and along a column, and in 3D, using the same tools as you used earlier (refer to View/Edit Properties section). •If your model is transient (this exercise does not apply), you can use the time controls above the Flex Viewer to change the output time; as you do this, all active viewers (layer, row, column, 3D), will refresh to show the heads for the new output time. 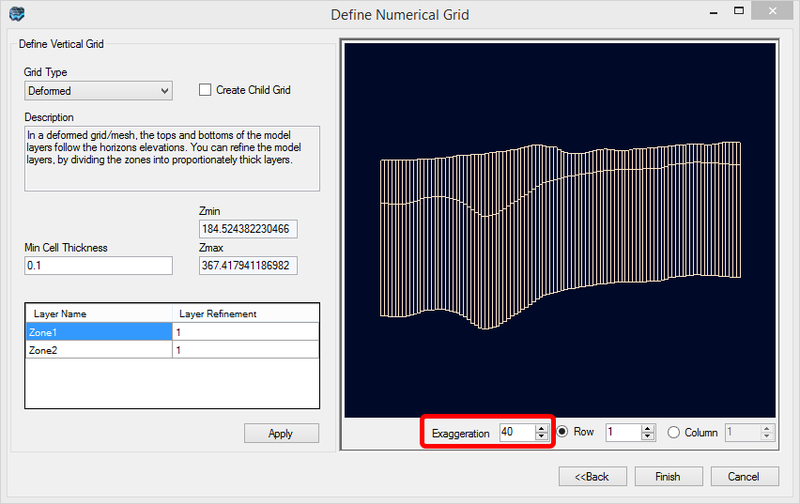 •The next section will discuss how you can generate a new grid with a different size and resolution, and generate a numerical model using this grid. 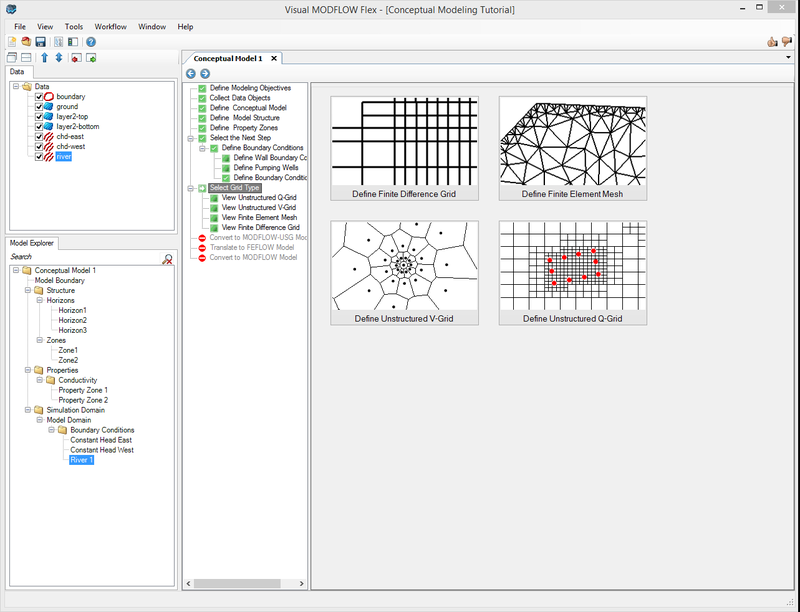 Often the initial grid size you defined is not adequate to provide the solution and stability you require from your model. 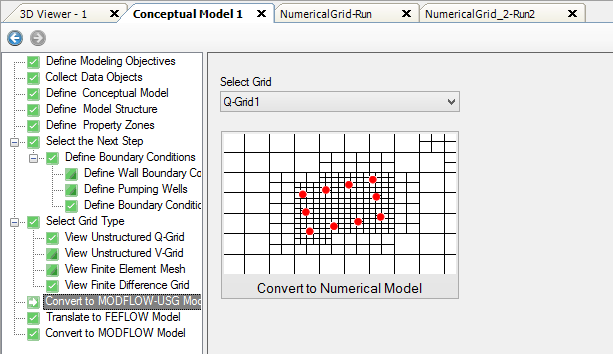 In this section, we explain how you can generate multiple grids from the conceptual model and run the corresponding numerical models. •Click on the first tab, which should be your Conceptual Model workflow to make this the active window, and it should now appear on your display. •Click [Select Grid Type] from the workflow tree. •Click [Define Finite Difference Grid] button and the Define Grid window will appear. •Specify the desired vertical discretization; you may wish to use a different vertical grid type, or refine any of the vertical layers. •Click [Finish] when you are done. •The new grid should now appear, and you will also see the grid appear as a new node in the Model Explorer tree. •Click the [ ] (Next step) button to proceed. 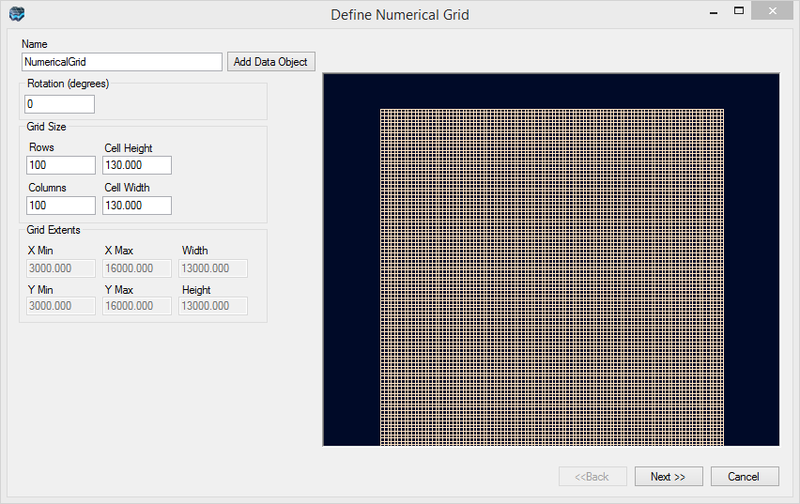 Now you are ready to populate the numerical grid/mesh with the conceptual elements. The 'Convert to Numerical Model' display should appear similar as below. Now, in the 'Select Grid' combo box, you will see there are 2 grids; by default, the grid you just created should be selected. •Click on the [Convert to Numerical Model] button to proceed. 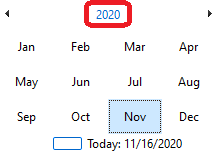 •After clicking on the conversion button, a new workflow window will appear which includes the steps for the numerical model for this new grid. 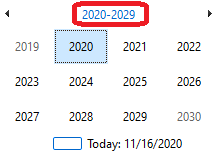 Please Note: the new tab is titled with the name of the new grid you provided and this new tab will appear in the list of active tabs at the top of the grid view. •In addition, this new model run will appear in the model tree. The model run has a grid and corresponding inputs; this can also be seen in the figure above. •When the conversion is complete, click [ ] (Next Step) to proceed to the Properties step. •Now, as explained previously, you can review the properties and boundary conditions, and translate and run this model. •Once the heads are generated, you can compare this to the results from previous grids. 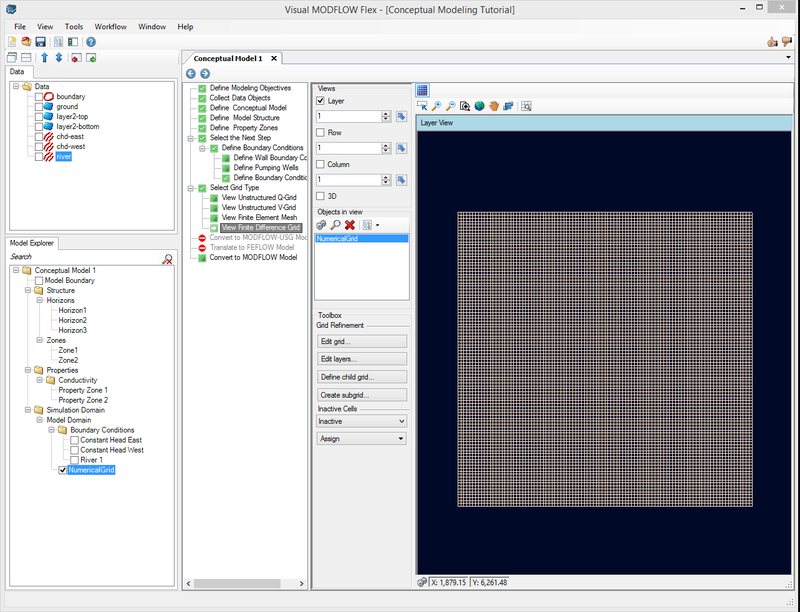 It's also very easy to generate different grid types (such as unstructured V-grids, or quadtree grids (Q-grids) when you use the conceptual modeling workflow. To test these alternate grid types return to the conceptual modeling workflow. On the 'Select Grid Type' workflow step you can select either the 'Define Unstructured V-Grid' or 'Define Unstructured Q-grid' option (the steps below are for a Q-grid example). 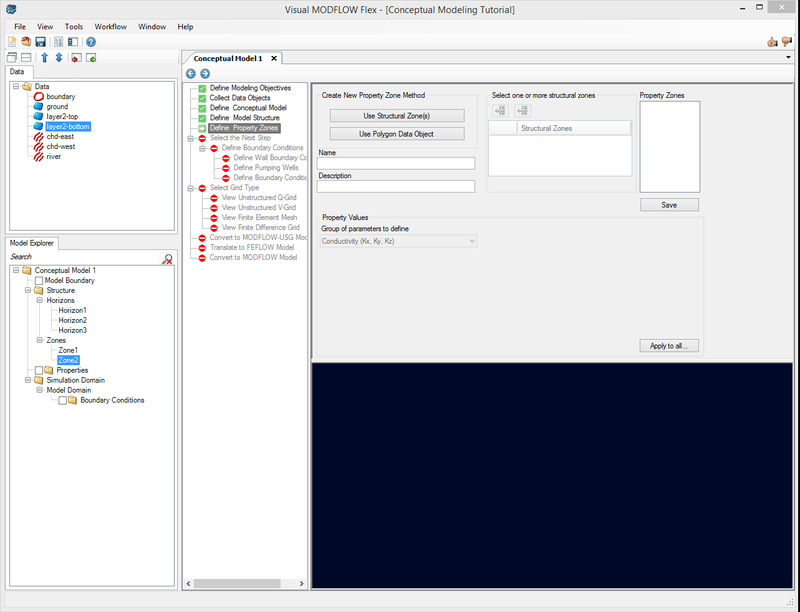 •Click on the first tab, which should be your Conceptual Model workflow ('Conceptual Model 1') to make this the active window, and it should now appear on your display. •Click [Define Unstructured Q-grid] button and the 'Create Unstructured Q-Grid' window will appear. 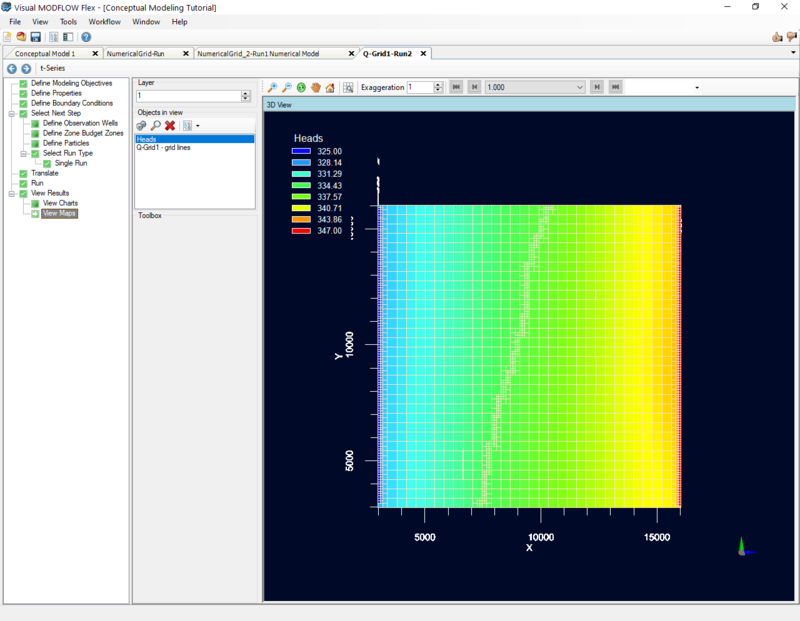 Let's perform a simple refinement around the boundary conditions within the model. Using the table at the top of this window we will visualize the constant head and river boundary condition objects, and refine the cells which contain these boundaries to a desired size. Please Note: it will be necessary to update the initial head values to something more realistic (i.e. 350m) in the Q-grid model run, since this grid type does not support the full range of initial head settings supported by finite difference models (i.e. it is not possible to easily set the initial heads equal to ground surface in the MODFLOW-USG translation settings). 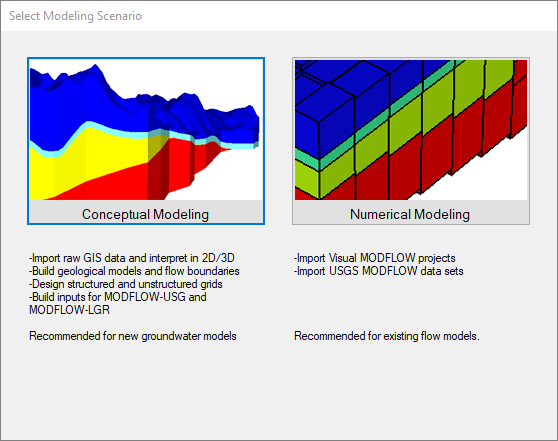 As you can see, the conceptual modeling workflow is ideal for generating multiple realizations of your model using different grid types, different levels of grid refinement, etc. This makes scenario analysis easier than ever!